Pelvic alignment, physiology of the hip movement and function, common hip issues. 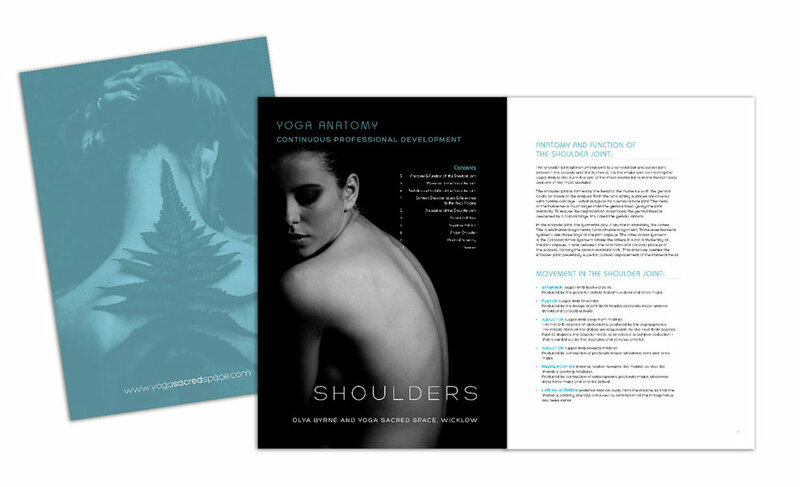 Anatomy and physiological alignment of the shoulder joint, rotator cuff injuries and common issues in shoulder movement. Anatomy and physiological alignment of the spine, basics of postural analysis, common neck and lower back issues, promoting stability and balance via yoga postures. FASCIA and the concept of integration. Facts about fascia, fascial approach to the yoga sequence developing and practice, integration of yoga class from the anatomy perspective. PRICE: €230 Weekend, 9am-6pm each day. Extend your knowledge in the integrated multi-dimensional body work. Guidance on recognition & correction of most common mis-alignments. Embodying techniques on relieving lifestyle created body tension. Experiential work on posture adjustments. Development of the practical anatomy orientated approach to your teachings. Tips on class sequences development. Advice on yoga practice choice based on the individual needs of your students’. Beautiful handy course content brochures. It is Teresa’s goal to train her teachers to become not just teachers of yoga, but Masters of Yoga. Her rigorous training course and standards have set the bar high. This ensures her teachers are highly qualified and Yoga Alliance Certified. Requirements: An enthusiasm and experience of the practise, preferably 2 years of classes and a regular daily practise. The course is a 200 hour course following the Yoga Alliance standards and registered. If you miss a weekend you can make it up , but at the students expense. Classes, as a gift are included to students who pay in full, before starting, but not workshops. how do we flow and transition? Recommended/required reading for study, dvd's recommended to watch as a group. Non contact practise, to build the non contact 100 hours required. Teaching methods, discussion. Teresa Murphy-Moore – Primary Teacher trainer EYRT and leads the Training course. Eyrt (Founder Of Yoga Sacred Space) Vinyasa Asana structured Practise, The subtle body anatomy,Yogic Philosophy and Wisdom, Nadis, Prana, Sutra's in practical use. How to Teach and how to be as a teacher of Yoga. Some Guest Teachers /contributors–The Practise /Teaching Tips/different styles THIS 2018-19 COURSE WILL FEATURE SEAN MACNAMEE OF BOSS HOT YOGA STUDIOS DUBLIN WILL TEACH US HIS SPECIAL CRAFTED MANDALA FLOW . Olya Byrne Anatomy and Physiology Practical -this is now a separate course within this course 9 a whole weekend,so more attention to detail and has its own certification., separate fee. Students will be responsible on qualifying to register themselves with Yoga Alliance.